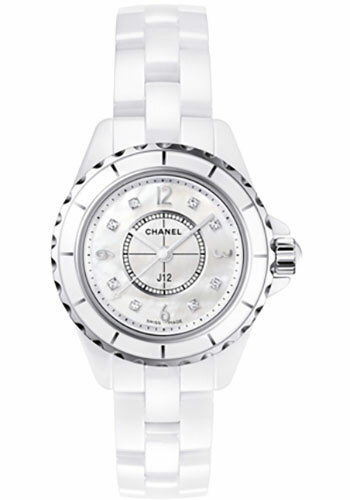 29mm white ceramic case, mother of pearl dial with white diamond hour markers, quartz movement, white ceramic bracelet. 29mm white ceramic case, stainless steel bezel set with 40 white diamonds, mother of pearl dial with white diamond hour markers, quartz movement, white ceramic bracelet. 29mm white high-tech ceramic case, steel back, screw-down crown, white ceramic bezel set with 40 pink sapphires (~ 1 carat), highly scratch-resistant crystal, white mother-of-pearl dial with 8 diamond indicators, movement with hours, minutes, seconds, white strap, ceramic bracelet, triple-folding buckle in steel. Water resistant to 50 meters. 29 mm white ceramic case, screw-down crown, fixed bezel with indicators on the flange, white dial set with 8 diamond indicators, quartz movement with hours, minutes, seconds, triple-folding buckle. Water resistant to 50 meters.